In an effort (unsuccessful) to stem the tide of weight gain over here, I`ve been on the bike a couple of times since finishing my journey. 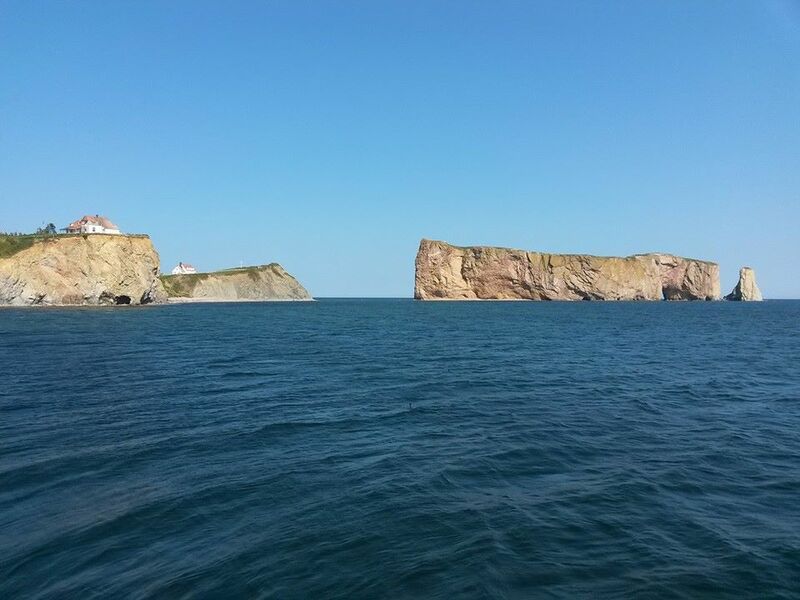 Today I planned an 80 km hilly ride to Percé, a tourist town along the coast which is famous for its `pierced rock`(Rocher Percé). Here is my first sighting of it from 30 km out. The ride was great, along a fast road with very wide shoulders. It was also an excellent workout, continuing the steep trend of the hills from the north shore. Yes, that`s 17%. 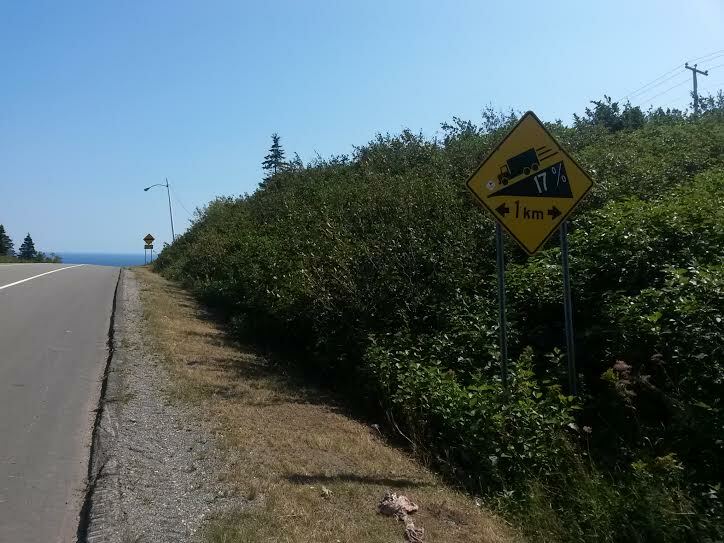 I didn`t climb it, but I did reach 83 kph on the descent. I`m still baffled by the gradients of the climbs here, especially since I`m from here and should have known better. I suppose I wasn`t looking at them from a cyclist`s perspective before. 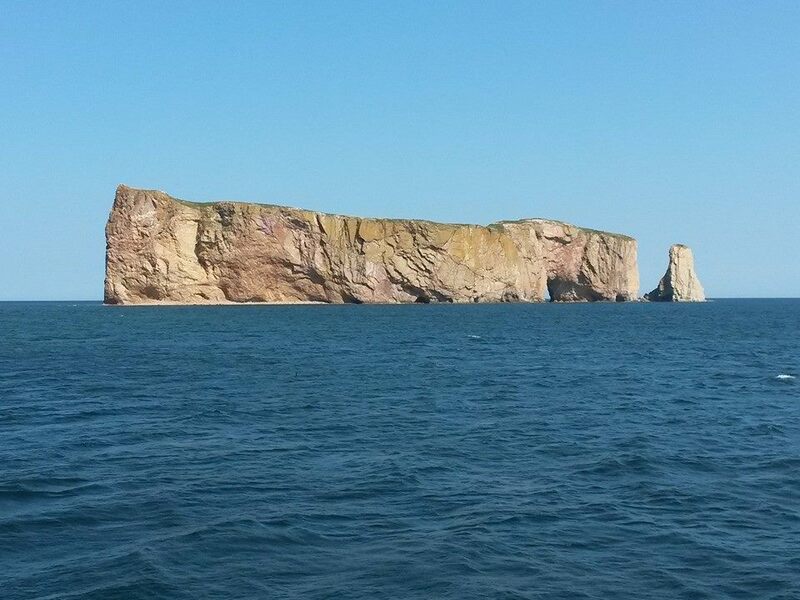 Every hill I hit in the `Percé Hills` was over 10%. An excellent fartlek. The ride turned out to be even harder than it could have been because I was supposed to meet my family there at noon. I hate being late, so I hammered it over those hills, hitting that descent sign going into town at 11:59. Here are a couple more of the rock. I’d be interested to know if any of you have ever seen this thing because it’s pretty famous in Canada. I haven’t met too many outside, though, who knew it existed. 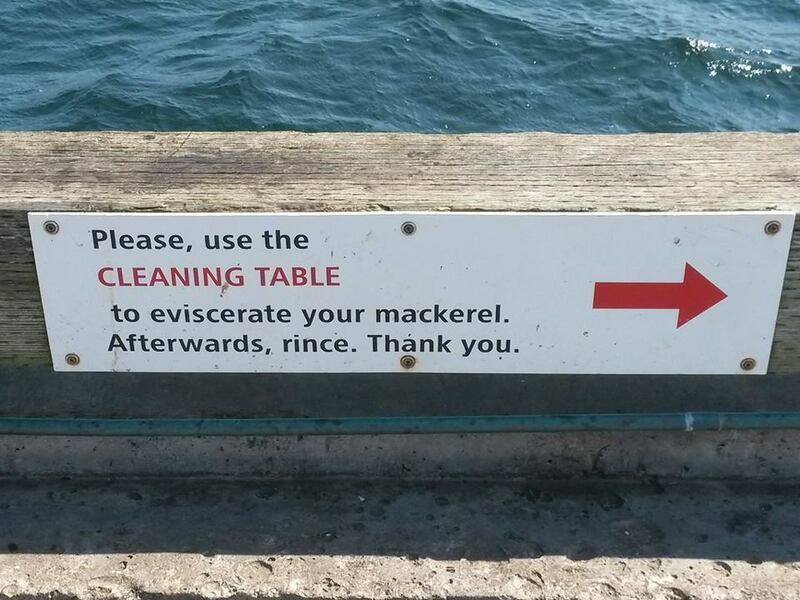 After some fish ‘n chips without the chips, I walked along the wharf and encountered this odd sign. You just don’t see the word ‘eviscerate’ enough these days. Finally, a bird for Tootlepedal. I’ve seen more exotic ones since coming back to Canada, but this is the first was who sat still long enough for a portrait. Going for lunch of a club sandwich with ‘the best fries in Gaspé’ today, so you might see me on the bike more before very long. Interesting how you can spell a word like eviscerate but can’t spell Rinse! Good point. I didn’t even notice that! What a wonderful bird picture. The pierced rock was quite good too. 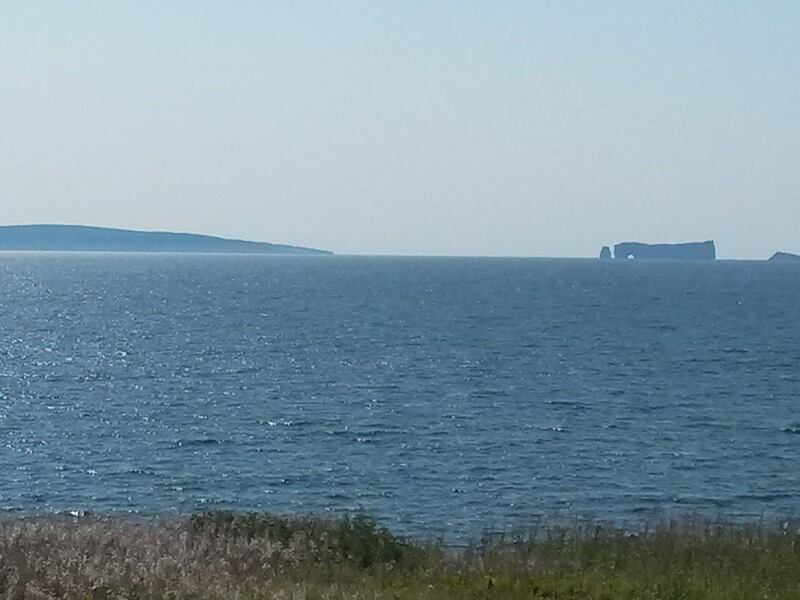 Don’t think I know of the pierced rock, but it is magnificent. Love the photos! Great cycling up there if you ever get the chance and/or motivation. I was there when I was 4,and even that young, and in a car, I remember the steep descent. 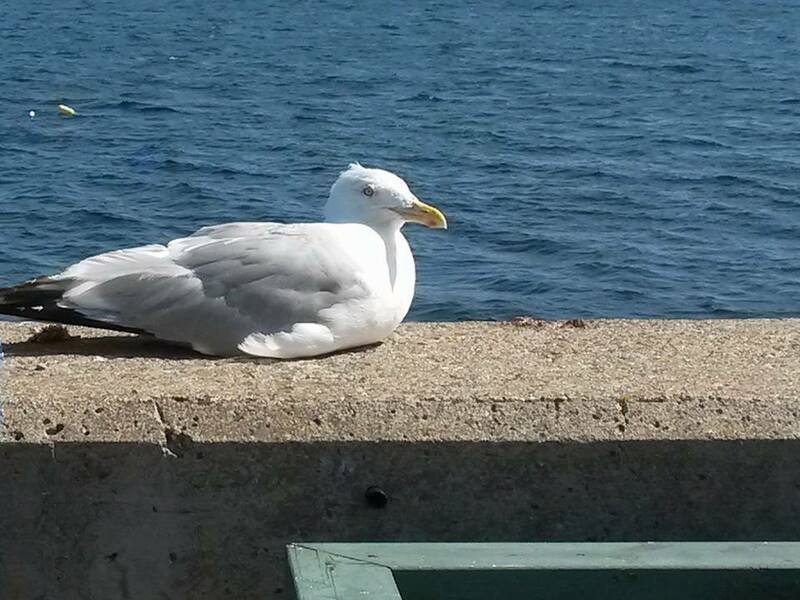 Also remember the rock itself as land of seagulls and guano. Isn’t there supposed to be a “magnetic hill” somewhere around there too? When we were young you could walk out to the rock at low tide and see the guano up close and personal. That’s all changed now.